This statistic shows the number of mandates in the Sami parliamentary election in Norway on September 11, 2017, by party. Norske Samers Riksforbund was the largest party voted to Parliament and received 16 mandates. Arbeiderpartiet ranked second with nine mandates. Nordkalottfolket ranked third with three mandates received in the election. The Norwegian Sami Parliament (Sametinget) elections are held every four years. The next parliamentary election is set for September 2021. The Norwegian Sami Parliament (Sametinget) is elected every four years. There are 39 seats in the Norwegian Sami Parliament, distributed in accordance with a method known as proportional representation. 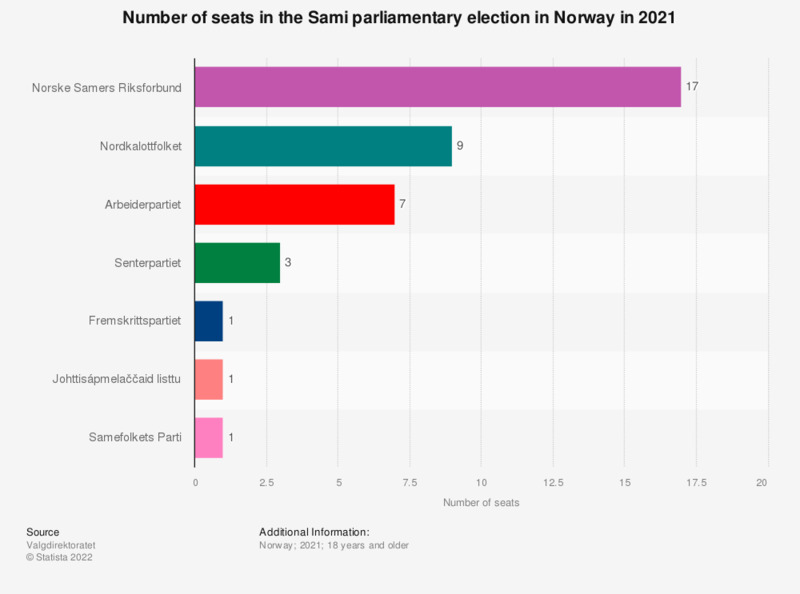 The system guarantees that political parties gain seats in the Norwegian Sami Parliament in proportion to the number of votes cast for them throughout the country.